Lord of Verminion is a Real-Time Strategy (RTS) mini-game from the Manderville Gold Saucer. You can fight against another player using your Minions. Your goal is to destroy the opponent's Arcana Stones. First, you need to finish the quest "It Could Happen to You" to have access to the Gold Saucer. This quest is issued by the Well-heeled Youth in Ul'dah - Steps of Nald (9-9). He will give it to you after you finish any of "The Gridanian Envoy", "The Lominsan Envoy" or "The Ul'dahn Envoy" main quests. Inside the Gold Saucer, talk to the Lift Operator at (4-6) to enter Chocobo Square, and continue on your right to get to Minion Square. Use any free machine to start playing. You need at least 3 Minions to play. 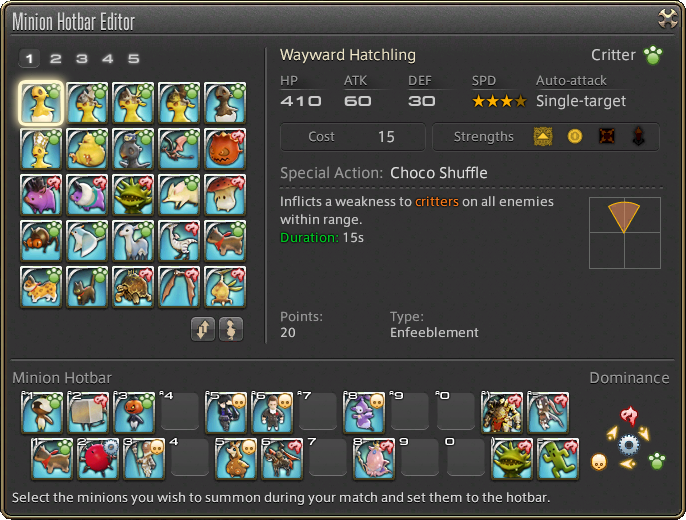 A Minion Hotbar is available from the Gold Saucer menu. Put minions in this bar, up to 24 of them, to be able to quickly summon them in battle.